In July 2014, Addenbrooke’s Hospital in Cambridge was given a scrapbook that had been kept by a nurse who worked there during World War One. 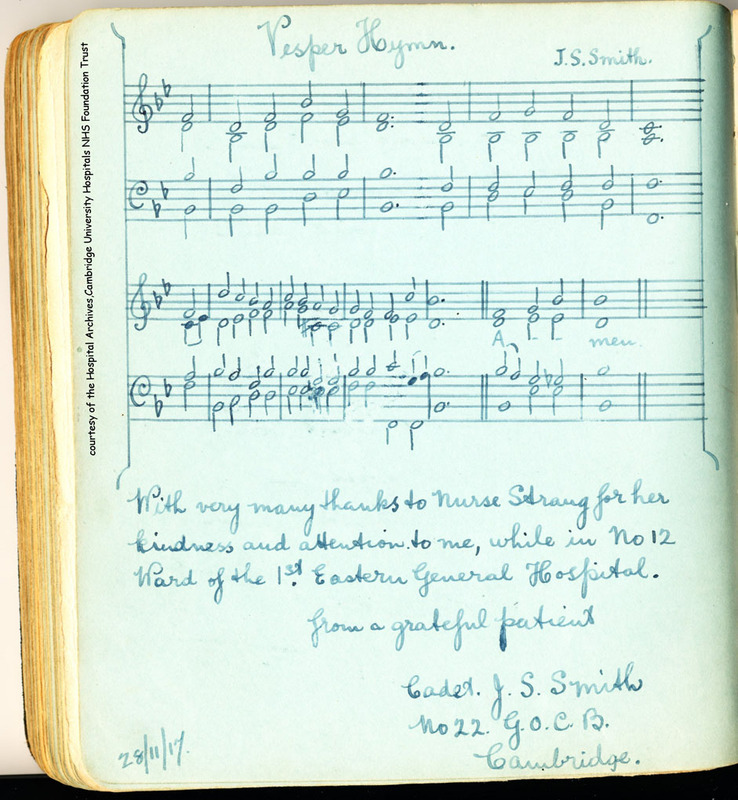 On one of the pages, a young cadet officer had composed a hymn, as a thank you to Nurse Strang. 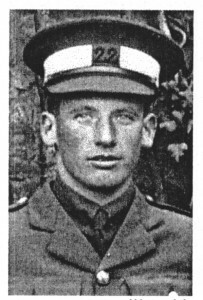 He signed his name Cadet J S Smith, and the date – 27th November 1917. Ninety-seven years later one of the choir members – Lizzie Hart – decided to try and find out more. Other old records gave her his full name – John Sidney Smith – and his home town of Stroud. She found a matching name in the 1911 census for Stroud, and a mention of ironmongers Smith & Lee in our trade directories, and contacted our Society to see if anyone could help. If she could find any living relatives they would be invited to a performance of the Vesper Hymn on 15th December – there was not much time! Howard Beard identified the man as Jack Smith, the organist of Bedford Street chapel who had played at Howard’s wedding. Jack’s own wife had lived in the house now owned by Howard and Sylvia. And Howard had an email address for one of the family in the Isle of Man. Here was the link Lizzie needed. 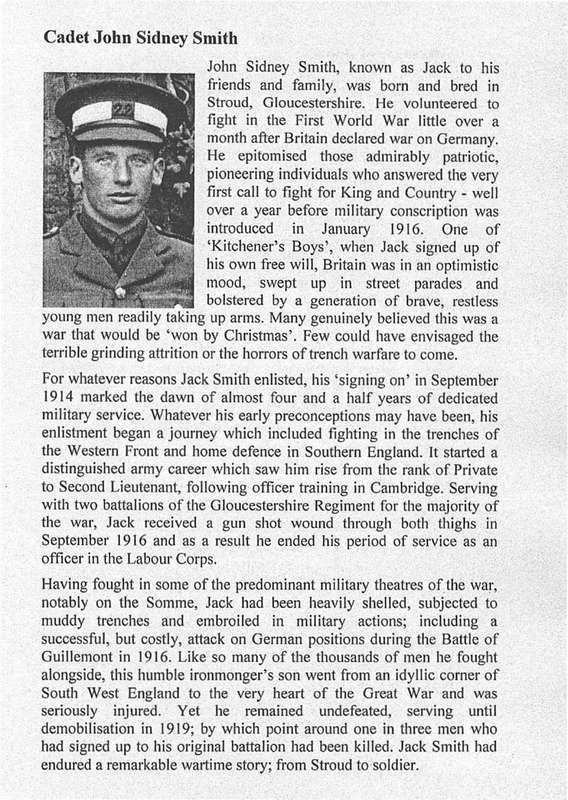 Tony Macer had a copy of Oliver Wicks’ book ‘A Lifetime in Rodborough Avenue’ that included a page about Jack Smith, and Pauline Stevens had a copy of ‘They Met in a Barn’ which had two pages, and photographs, so we scanned those pages too and sent them off to Cambridge. But with a name like John Smith, more research was essential to confirm it was the right man. Lizzie went to Kew and searched the army history records, with great success. Sorry for the group email but I thought you would all like to know I have found a relative of Jack Smith. His son Tony and grand children are all alive and well. Tony is quite elderly and we are not sure will make it to the concert, but his son Michael will be coming and hopefully more of his siblings. Michael said he would be delighted to hear from those who knew Jack and his family. I am so happy now we have the full picture. More has come of this too as Jack’s school (Marling School) are very interested in our research. Many thanks for all your help in finding Jack and Michael! 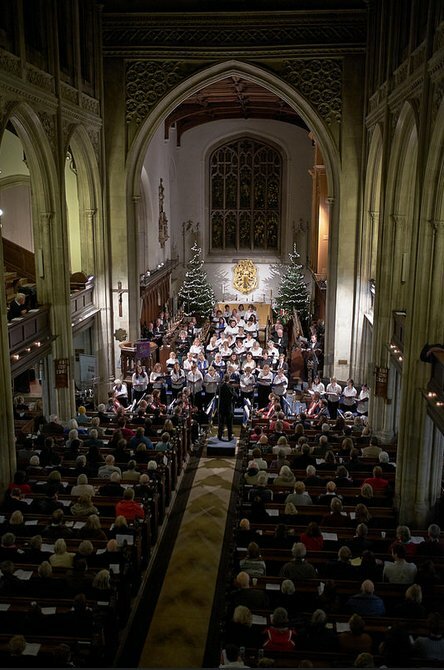 The choir’s fund-raising Christmas Concert went ahead on 15th December, with Michael in the audience. Everyone was delighted, and in tears. Lizzie said, when it was all over, that without our on-line trade directory transcript, and Howard’s subsequent information, she would never have identified the right John Sidney Smith, or been able to invite his grandson to the concert. She sent a dozen copies of the concert programme for local friends of Jack, and for our SLHS archive. And at our annual Gala in February 2015, members listened to the Addenbrooke’s choir’s moving performance of the Vesper Hymn.